It’s been more than a decade since we last visited the Underhive, but very soon you’ll be able to battle it out in the depths of Hive Primus. If you’re new to the hobby, you may not be familiar with Necromunda – or perhaps you’ve only heard about it from the fond memories of other hobbyists. Necromunda dives into the underworld of the Imperium, allowing players to control their own Hive Gang – a pack of ruthless criminal killers augmented with black-market cybernetics, gene modifications and scavenged weaponry. Where Warhammer 40,000 puts you at the head of an army, in Necromunda, the scale is much smaller but the action is just as intense – every single Ganger counts. Between intense skirmish battles, your gang will grow from a pack of battle-hungry Juves to a feared and respected syndicate of hardened veterans. To get there, however, you’ll have to battle against your fellow players, each with a gang of their own. The Underhive is a big place, and the gangs that inhabit it are as diverse as the alien races that inhabit the 41st Millennium. We’re launching Necromunda with two classics. Gangs from House Escher are fast, deadly, and cruel. While lightly armoured, these cunning warrior women hold their own in melee combat, while at range, they are notorious for their use of armour-melting plasma weaponry. The gangers of House Goliath are a living testament to brawn over brains. Every member of House Goliath is a slab of vat-grown muscle, armed and armoured with repurposed industrial gear. What makes these miniatures even better is that they’ll be available in multi-part, plastic kits – so easy to assemble, customise and paint into a gang of your own. Keep your eyes on Warhammer Community for all the latest news and previews. Oh I dearly hope so, but was that not the name of the videogame? Or was it Underhive Wars or something like that? That was called Underhive Wars, yeah. Its also in the event programme, which you can see here. The computer game is Underhive Wars and has a different logo compared to this, so looks like this is something else! A black and white illustration seems odd for GW though. Their graphics folks tend to use more color. Could be recycled, previously unseen artwork? Hnnnng. Someone kidnap Andy Hoare and get him talking immediately! So, baseless speculation - do we think the art is an Escher redesign, a female Ratskin, or something else entirely? EDIT: Also is that a laslock I see on her shoulder? Hope they make Arbites. I want to make Arbitrator Forboding. From one of the Community team's Twitter accounts. Looks like a female Ratskin to me! All of the this. They have such an opportunity with this to give us a range of interesting quality female model sculpts in multiple styles. Christ my wallet is crying just thinking about all the new INQ28 projects this will make me start. Yup. I'm really excited. When I first started getting into the hobby they were doing a Necromunda campaign in White Dwarf, I still dig them out and read it occasionally. Would also provide a cool source of Imperial Guard Conscripts. ..Plastic Arbites too with a bit of luck. easy to do a datasheet/whatever for them to be used in 40k too. Some pics, multi part plastics confirmed. The return of the 40k RPGs and the return of Necromunda. Does nicely explain the lasgun shown a few weeks ago. Ma boys. MA BOYS! MAAAA BOOOYYYYSSS! Seems Goliath's are now 'Vat-Grown'....or at least have extra muscle from Vats. Here's hoping we get even more snippets and infos soon. And let's also hope, purely for my sake, that it comes out later November when I gets me bonus! Ok got slightly worried thinking they would be FW resin and then read multi part plastic and thus a new wave of joy hits. Sweet Jesus that is awesome! I'm not in love with the paint scheme on the second Escher, but these are undeniably Eschers/Goliaths. Those House Goliath will be a proper sort for some Khorne cultists. ohhh goodlord...GW you monsters!! new death guard, including bloody daemon primarch mortarion...and now freakin' necromunda??? M_r_parker who is at the event said 'expect Necromunda by the end of the year, and all old gangs within 12 months'. Can...cam we all just go and get a quick drugs test? Make sure we've not been hallucinating GW over the past year or so? Oh man I hope Cawdor look amazing enough as fanatical Imperial fanatics. According to Lil Legend, who are in attendance, it's out late next year, two gangs in the box. Yay! They look awesome. And plastic too! Great. I'm hyperventilating, it's BACK. Holy crap GW 2018 financials are going to be nuts. They've painted her skin like a Necromancer recently returned her from the grave. Everything else is fine though. Article does mention gene-engineering. Could be reflective of that? If not, pretty sure I'd shoot her on site because Clearly A Hybrid! Well, they do live in sunless, toxic environments. Also, that second Goliath has to be a juve or something, that stub revolver is massive in his hands. So I doubt we'll be getting new terrain to go with these. Don't do this to me guys, end of this year or end of next year?! Also I think they had the same guy do these as has been doing the Blood Bowl models and some HH stuff recently, not a style I'm fond of personally so I'm hoping we get to see some bare plastics or at least some renders. The Goliaths are glorious. Eschers... are disappointing. I'm hoping that's just the paintjob, but they're missing the pop! of the original models. Multi-part plastics to reinforce my existing gangs is certainly exciting. I suspect it'll be this year though. 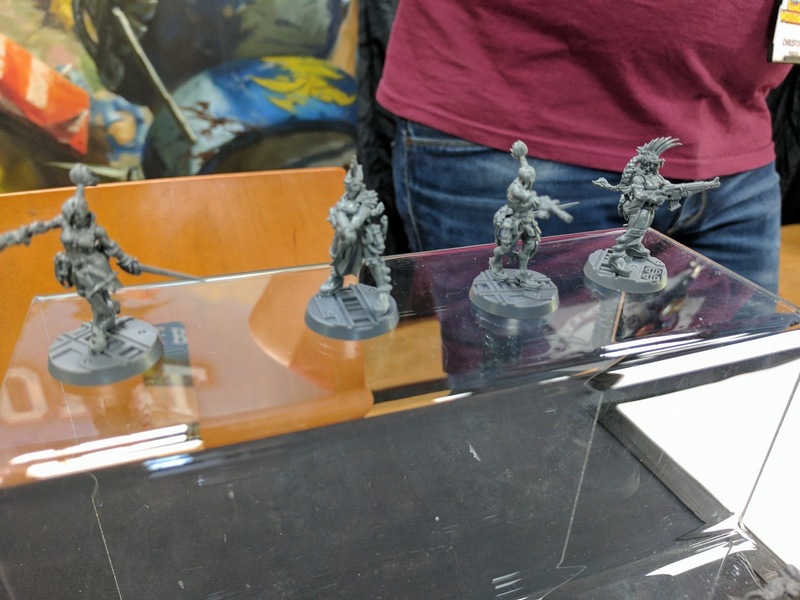 The sculptor who did the Gal Vobrak and Palatine Blades has been working on Necromunda stuff. I think its fairly random how things get painted in FW, sometimes it goes to an official painter, sometimes one of factory people do them. He does look very small. He looks to be mounted on the same sized base as the the one above. I've been away from GW for quite a while now, what the hell is with those godawful paint jobs? Are they employing 6-year-olds of for their promo figures or something? Other than that, here's hoping that it captures the spirit and depth of the original. One does wonder if they're just updating the old rules, or perhaps going after Infinity's depth? I've not played Infinity before, but I'm open to the idea. Don't poop this party, Brook!!! Oh yeah, gak, even from that blurry image you can see the guy who painted the Escher screwed up the face and blew out all the detail. The bases above are plainer. We may yet see new terrain to go with them. Though I'd be happy enough with more or the same from Shadow War. Yeah, the bare plastics look fantastic in my opinion. The painted ones are okay (better than my painting anyway) but don't show them as well as the plastics unfortunately. Ooh, custom bases, consider me corrected. It may hint towards more terrain, but again, I doubt it, as we've got a crapton of industrial terrain a few months ago that's quite nice for Necromunda. I do hope that these bases are sharper than the current selection of themed bases out there, they're nice, but soft on detail. Do you know what maybe my favourite thing about the plastics is? Those Escher girls are fething ripped, look at the arm on that rifle girl. So glad they didn't end up all willowy and dainty. It has been said that they dropped the 'Eavy Metal people. They now paint showing easy-to-do paint jobs, so new painters are not put off. Great illustration and fantastic news! Just let down by some dodgy paint jobs. All these delicious new female models that aren't updated Sisters of Battle. I want it to continue forever, to draw out the agony of their fanbase. Mostly, I'm impressed that the 'classic' range and the new ones don't clash at all. Hopefully they're like, Blood Bowl team cheap. If so, hello Chaos Cultist sources! I think a lot of grognards will end up hating this. Is that not par for the course though? I doubt they'll be that cheap. Blood Bowl teams are monopose with repeats, where as these will have loads of options in by the sounds of things. Good point about less models, forgot about that. About the same price then. Probably £25 is my guess. Based on? Because of? Due to? If you're going to poison the well, at least give us a reason. Proof of the pudding for me will be how gang expansion packs work. It's all well and good if the core gangs are cheap enough (I'd pay up to £35, depending on the options). But if adding new gangers is difficult or expensive, perhaps not so much. Of course, if the core gangs come with lots of spares, that gives some leeway on expanding. Yeah I'm one of those grognards, apparently, and I'm stoked by this. I mean, the rules may turn out to be like Silver Tower - perfectly serviceable but failing to capture the original's magic - but who cares when there's new multi-piece plastic Gang kits? I hope we get a proper advancement system. Rules don't necessarily matter, people who have been playing for the last few years have been using community rules anyway and can stick to them if they don't like the new rules. What it does mean is new models and more new players because it's now a supported accessible game. THIS is the GW it should have always been. Intelligence, willpower and cool stats from RT return! Sounds interesting a wee bit more depth than previous? Just been reading up on all the different gangs and characters in them. Im melting from thinking of all the possible models. Dogs, plague zombies, cyborgs, I AM THE LAWWWWW fellas, crazy fanatics. My.God! Edit: And listening to Mad Max soundtrack made me realise my Red Corsair army will now have proper post apocalyptic cultists in it. The part that I like the most about this is the variation the new miniatures allow. I mean, I love Necromunda, but at the end of the day they only ever released 17 Delaque miniatures, and 17 Cawdor miniatures and 20 (IIRC) Escher miniatures. New plastic versions that can be given tons of different weapon options? That's fantastic. And including the things that just weren't around at the time (Needle Pistols, Web Pistols/Webbers, etc.) now that they have them in the CAD files, well that's even better. These will in all likelihood be true. I don't think it matters to them that much. They already made a ton of money from shadow war and now everyone has some good terrain to play Necromunda on. They want all the existing gangs out in 12 months so yeah should be. 40k 2nd got me into wargamimg, but necromunda is what made me a wargamer. Bring it on GW! I will even buy all that expensive plastic terrain now! Damn well better have rat skins in the base game though! My lads need a new paint job anyway, hah. Welll Esher look halfway decent, lost a bit of the charm they had in their first iteration, but thankfully did not get the full "grimdarkification" I was dreading GW would do. Call me interested and its been 20 years since I said that for a GW product. Here's hoping Outlaw gangs won't be so dull! Perhaps it was more their players, but I never really enjoyed them that much. Let's get back to the excited frothing! Will definitely instabuy and play this. Was waiting ages for a Moordheim/necromunda rebuilt. And with GW new policy on balancing we can expect a solid change in the ruleset, even more bold than in bloodbowl ruleset. "Game loosely based on 8th but expanded mechanics. Intergrates turn sequence, model by model activation. Leaders and champions help.."
"By activating additional models, juices need to be near others to guarantee activation"
"Action based and with the full Rogue Trader stat line...."
"More skill tables including leader and trade ones." "Plastic gangs and then outlanders then expanding to new gangs!!!! Takes time." "Working of John Blanche original sketch book for more awesome stuff. Release should be November slot. First 6 gangs release schedule sorted. It's also worth mentioning that Shadow War wasn't expected to be anything beyond people buying it for the new scenery. Remember how long we had to wait for the rulebooks to get released by themselves? Hmm. Not convinced by the idea of new rules, was hoping based on Blood Bowl it would be a quick tidy of the existing ones, but I'll reserve judgement until we know more about the postgame. I'm cautiously optimistic. I was very much expecting resin and thus, very much was not going to buy anything. Plastic changes everything (even though I'd still take metal!). I think GW might be shocked by the amount of sales from all over the place for these minis - and how many people will be buying the box just for discounted terrain (i.e. those who missed out on SWA). The plastic minis will all make great cultists and optional 40K minis for a variety of bits/equipment. Goliaths will make perfect cultists for Khorne, etc. Cawdor hopefully could be used as Imperial cultists themselves. I do hope they release arbites with cyber-mastiffs etc. There's quite a large old school Necromunda base which will buy the models even if they don't adapt to the new game, etc. And I know, I know, I know, I know, I know I want it!!!! I'm delighted there are new rules. Alternative activation in a GW game? Amazing news. Really looking forward to some new spyrer models. Always thought they had a lot of potential but the models they came up with looked ugly. Indeed, there's all sorts of potential there. 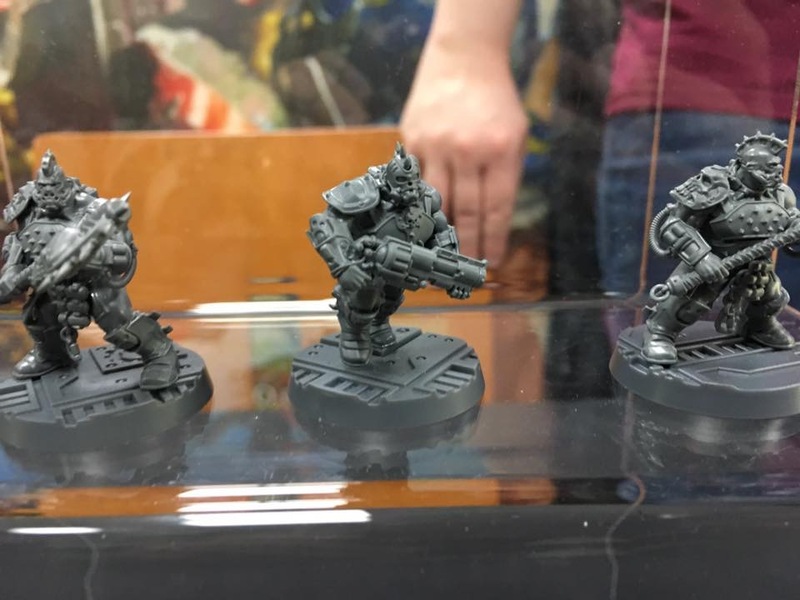 My concern, from those pics, is that they look awfully tall... Will be a bit of a bummer if these are Primaris scale. Having been spoiled for years now with a balanced and supported ruleset from Corvus Belli, alt activation in a skirmish game really doesn't impress me. Getting functional reactions (lol at "overwatch" in 40k...), like a reason to care about what's happening in my opponent's turn and some interaction beyond rolling saves, that'd be nice to see. Shadespire has alternative activation too. Good to see gw changing their typical formula up a little. I'm of the opposite opinion - my one disappointment with Blood Bowl was that they didn't take the opportunity to build a slicker, more '2017' set of rules. As it is I now have a wonderfully produced game with beautiful figures that no-one wants to play with me because it takes forever to even get to half-time :( A new set of skirmish rules, especially if it has a new activation system, sounds amazing! I'm going to need at least one of every box of models they release for this game. I'm going to die a happy man, drowning in little plastic gangers. It's going to be expensive, but I have to. It's in my blood. Hell yeah! The price shouldn't be too bad though if you've gotten used to paying eBay prices for Eschers! Painter confirmed on FB that eschers are on 25mm and Goliaths on 32mm. So Eschers should be in scale with other human ranges. "We have an info dump of information for you from speaking to the amazing Specialist Games veteran designer Andy Hoare at The Forge World Open Day 2017. So we are broadly looking at a game based on the 8th Edition 40k mechanics, but tailored to skirmish warfare. We see the edition of Action Points, that can be used to active gangers in a similar way to how Space Hulk works. Different actions will cost different points, such as activating a Heavy will cost two Action Points, whereas your run of the mill Ganger will cost only one. We are looking at a release schedule much like BloodBlowl, this is the ‘Preview’, launch of the initial box set will follow in the same sort of timescale as from when BloodBowl was ‘Previewed’ then launched. The box itself will contain the Escher and Goliath gangers we have seen already, the rules, accoutrements and most likely Shadow War terrain. The Specialist Games studio do not have the resources to produce terrain solely for Necromunda, so they are trail blazing the Shadow War release with all the cool terrain that was released with that boxed set, and subsequently in individual kits until present. The rules will allow for play in the way we are used to on gangways, ramps and gantries, but also in tunnels making use of the Zone Mortalis tiles available from Forge World. We will see all the gangs from Hive Primus return, along with the gangs from Outlanders and Fanatic. 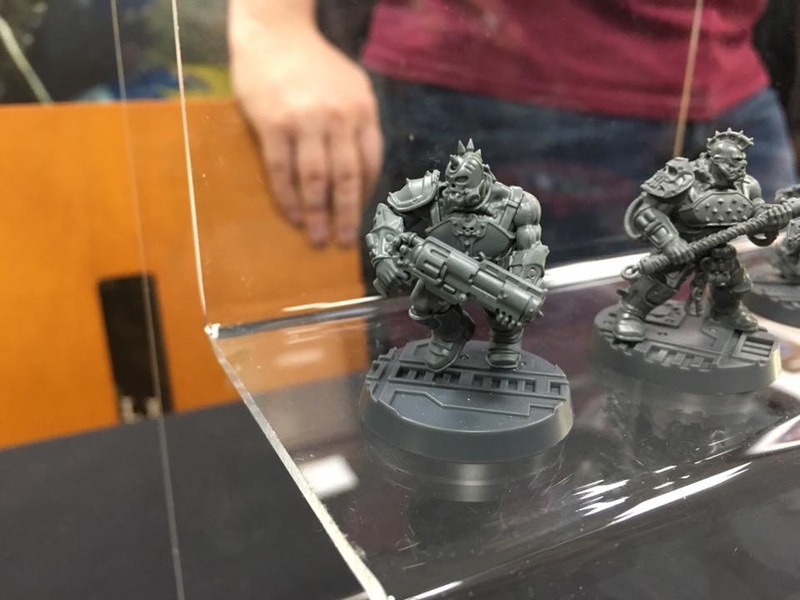 We will also see new gangs and some expansion of the fluff on Necromunda. HIVE SECONDUS was written about in the Fanatic days, a Hive overrun by Genstealer cult, nuked by the Necromunda Defence Forces to rid the planet of the infestation. However, the hive toppled on its side with most of the Cultists surviving resulting in the Defence Forces building a large trench system in the surrounding Ash Wastes to isolate the remains of the Hive from the rest f the planet. It is hinted we will be visiting this intreaging story in the future! We will be posting updates as we get them!" Those Goliaths are going to be huge then. They're going to dwarf my Catachan/Marauder conversions like my conversions dwarf the original models! Do you have a link to their page? Oh that, can they just retire him and never ever use his art as inspiration ever again? his vision is what ruined the elegance of 40k and turned it into the "grimdark" visual waste it is today. His vision was stellar in Mordheim, but nowhere else. This does nothing for me. It's in that weird zone between large scale wargame and an rpg tabletop game that just doesn't cut it as either for me. I'll be waiting for 2018 as well, for the new 40k rpg. Good to see others happy though. No, his art was pretty much the basis of Necromunda. As with Mordheim vs. Fantasy, Necromunda was supposed to be waaaay darker than 40k. John blanches vision built the 40k universe, His artwork is in every edition and the contrast between his and jes goodwins style is what has given 40k it's unique blend of baroque eccentricity and sleek retro futurism. necromunda back in the day was based almost entirely on blanches work, Making it without looking at his sketches would be stupid. Freaking fantastic news! This is basically everything I had hope for in a new version of Necromunda. New rules, new gangs, new locations. I'm of course happy to have all the original gangs redone as well, but after playing Necro off and on since 1996, I'm open to them adding more to it! The Hive Seconus setting sounds awesome. I'd love to see Ash Wastes make a full return. Best news from GW in years! Jess and Priestly build and made 40k what it was, Chambers and Blanche devolved it to what it is, no surprise in Necromunda the only gangs I liked and the Gangs that were most popular were the ones designed by Jess and not the ones Blanch inspired. The sleek elegant design of Jess were small details show the devolution of the sci fi elements of 40k are what it made it intriguing what separated it from other post apocalyptic settings, Blanche entire work is a blunt post apocalyptic sci fi barbarian with hellish visions thrown in for good measure. Likewise Ricks Narrative was smart and elegant placing logical and everyday scenes in the uncanny valley were simple everyday things are jarringly out of place, Chambers took it to the comedic extreme. It's not so much easier as it is a worry the community will end up split if the new rules aren't up to much - for all their flaws we know the old rules are fun, and a lot of those flaws could be fixed without any radical shifts, so my preference was that they stuck with the old rules to make sure we couldn't have a post-End Times WHFB community situation. As I say though, I'll reserve judgement. I understand that not everyone is into Blanches art or design work; it's all subjective, of course. But so much of the look and style of 40k is basically torn right out of Blanche that his persistent detractors really do have to make some impressive leaps into their own fantasy in order to slate him. John Blanche is as 40k, through and through, as much as Jes Goodwin and Rick Priestley. You might not like him, but don't go rewriting history in order to count him out. I understand the desire to just fix what was arguably the best system GW ever produced. But after 20 damn years I'm ready for something fresh. It sounds like they are keeping with the spirit of the original, but modernizing it, as well as pulling old concepts from Rogue Trader. If they really do take great aspects from all the sources, I am optimistic it will be a ton of fun. And to be perfectly honest, after 20 years I think a minimal update would grow old quickly, as ultimately it would just be more of the same. As good as those rules are, I can see myself playing them for another 20 years. I want to say basing this game on 8th 40k is a recipe for disaster, but hopefully that's just marketing talk and they rewrote the whole thing (as implied by "tailored to skirmish warfare) and put way, way more thought into it.. I guess we'll see. I like that they let Escher take front stage, and I say that as someone who liked the vanilla appearance of Orlocks. GW could do with a lot more good female models. More importantly, female human models. Those are stupidly hard to come by for some reason. The paint job on the shown Escher is all kinds of dodgy, though. Like someone painted them who was told what the eighties were like, but never saw them themselves. Goliaths are Goliaths. No surprise there. They're growing muscles on muscles now, it seems. As someone with limited terrain options at my local store, I like the suggestion there might be integration of tunnel fighting. Necromunda had a nice vertical element, but a bit of variety doesn't go amiss. 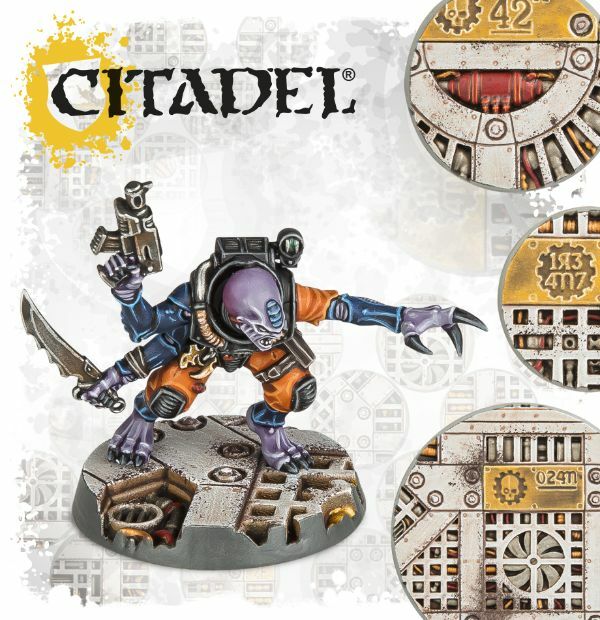 It's good that they focus on classic gangs first and that there may be Genestealer Cultists. Well, rules for them anyway. The models are here and ready to be used. Would be a shame if we had to wait. Hopefully they'll go the same route as with Bloodbowl and release a PDF get you by list for them. I would looooove to know how/if we're getting Arbites. Time for a third job . Given that about 9/10 requests are for Arbites there must be a pretty good chance GW will pick up on it! They've said they're doing all the old gangs. Hopefully that includes the spyre hunters, I used to love the two malcadon sculpts and their fluff. I must admit that while I don't like how vehicles play out in 8th the small scale shooting stabbing parts work well enough that I think it could be tweaked into a solid game. Fear some size creep but if the miniatures scale with that new inquisition 'grey what's her name' figure I'll be happy. Wonder if we will see a maddonna and Bonnie figure, or if they will be inspired by a more contemporary pop idol. Here's a thought, maybe we will see the old gang metals back as made2order as well satisfying everyone who always wanted them. Arbites were an original gang, so I imagine yes we will see Arbites. Given that I don't believe we ever got the "Made to Order: Order"...I'd doubt that will be the case. I know, isn't it delicious. Were they considered a legit gang? I never, ever treated them as such. As far as I remember, the whole point of the Arbites was to act as a campaign balancer; if you ended up slated to fight a stupidly powerful gang, you fielded an Arbites force instead because they were pretty much guaranteed to tear through even a very advanced gang. I doubt they'll miss the opportunity to add Arbites in, however, and I'd buy a box in a flash, but I'm not as mad about their old rules. Hopefully, a new ruleset will lead to them being a more realistically balanced force. There were Enforcers, not Arbites. Different things. They were sold as "Adeptus Arbites Enforcers". They were sold as a gang box set. Wouldn't shock me at this point if Enforcers became a unit for regular 40k as well as an ally to other Imperial forces on the planet. I just really, really hope they come up with a decent campaign system. The random stuff between missions was the biggest cause of attrition in the last campaign I played in, and a good or bad run of luck there could often make the actual games feel inconsequential. But hyped, all the same. New Necromunda is fantastic news. Tons of new conversion and bits options for cultists and Renegade mutants and militia is even better news. Pretty sure if this sells well enough we will be getting a new Mordheim sometime in 2018.
where policing is carried out by Necromunda Enforcers." Is it just me, or do they look like single piece models rather than multipart? We dont know anything about their poseability. Bodies could be like the new Primaris'. Anyway looking at the plastic's colour these do not seem to be the final models but pre-production miniatures. But good that Necro gets 6+ plastic gangs basically right from the start Who would have thought last year? If those are from the starter set, which it appears they are, those ones might not be multi-part. Same as previous boxed releases. Keep in mind that the single pose models in the 40k starter sets are also 'multi-part', but aren't that posable. So I'm curious to see what will happen here. Well...either way I'm totally happy here! Yeah, I was assuming those particular models are monopose ones for the starter set. 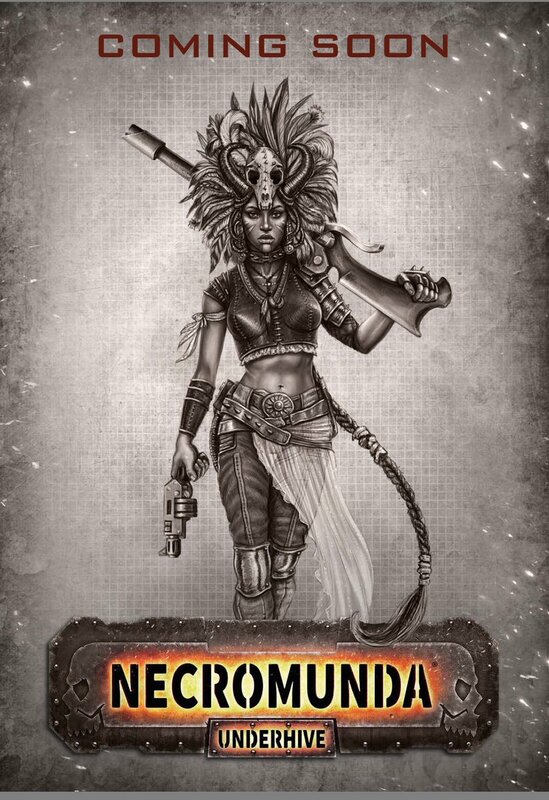 The Dark Imperium models don't come with options but the Necromunda ones will - according to the WarCom info. Tbh anything else would make no sense for Necromunda. You need lots of different weapons. It is as vital to the game as a pitch to Blood Bowl. I cannot see them going back to models without options, that would be nonsense. I am not sure how they managed to get four sets of two models identical from multi part, presumably also multi posed, models. Usually GW uses the words multi part to mean multi posed models, instead of what the word really means, been many parts, but I am puzzled on how identical all the models shown are, maybe indeed the starter box models will be monoposed? It wouldn't surprise me if the starter set models are assorted singlepose, with later gang boxes being multipart. I assumed they just showed the models built to match the 4 painted ones they were showing off, because they don't want to show off any more yet. Necromunda needs options, as said. I'm not sure they'll have specific starter gangs, I assume the gangs in the starter will be the usual Escher and Goliath gangs, and they'll be released separately later, like with blood Bowl. Not sure why the blurb mentions cybernetics and gene-mods- those weren't widely available for the baseline gangs, but that makes it sounds like basic gear assumptions. Specialist Games is part of FW, but they sell stuff via GW and retailers etc (see Blood Bowl). I'm assuming the four models shown are pre-production models; could be resins, could be that they don't have enough done yet for a full sprue. What I see is a perfect conversion material for Astra Militarum/Chaos Cultists/Inquisition in 40k. Can't wait to see these multi part plastic boxes, but I expect some monopose like the Blood Bowl teams. I wonder if they will include juves. I'm not sure it will be the case, but whatever, honestly. Sooo many things to play with now...can you imagine what you can do with those and the other existing ? I would bet money on a similar approach to the original Necromunda actually - essentially monopose w/ optional weapons being push-fit. It'd be nice if they threw in different heads, but I doubt it. Other way round. FW is part of the Specialist Games. Kinda what I was thinking. E.G. Escher Ganger is single pose but you can attach either an autogun, lasgun or shotgun. Shame these look like they'll look oversized compared to the original models. Would've been nice to supplement our old gangs rather than have us replace them completely. Love all the detail they've been able to cram on them this time though. People do come in different sizes though, so a good mix wouldn't look too outlandish. I just hope the scale is close so I can mix and match old with new.. but after seeing the new marines versus old ones.. it makes me worry..
Ah, the memories...I actually painted those Arbites. Was thrilled to see that the paint scheme seened to stick. I had about six gangs back in the old days, unloaded it all... pretty much assumed I'd never play again. Looks good... ...but... ...they may be larger than space marines which would limit their use for me. Stupid scale creep. We have an info dump of information for you from speaking to the amazing Specialist Games veteran designer Andy Hoare at The Forge World Open Day 2017. We will be posting updates as we get them! Yeah the scale creep could be an issue for sure. Ive never tried Necromunda, what made it so good? Id much rather play with my SW models than some junkie hiveworld ganger. Id much rather play with my SW models that some junkie hiveworld ganger. An actual setting? Shadow War has no storyline or setting, it's just a bad version of any other skirmish game. Also Necromunda sounds like it will be based on unit activations which is how almost every modern and successful skirmish game works. Congrats to those who were right this time, and at least think they got what they wanted. I'm still out. There are just too many games, and too little playing time out there these days for me. I don't think there is any big or small box release from GW in boxed games that could get my attention these days. Good luck for Necromunda; hope it goes better than Blood Bowl 2016. -Necromunda box is gonna be below the 100€ mark. -An escher is taller than a old space marine. So the new Necromunda is probably be in line with the newer Deathguard, Thousand Sons, Deatwathc and Primris. This is massive... its amazing... its what I've been waiting for since I came back to the hobby four years ago! SO happy! Considering Blood Bowl is an incredible success, that would be pretty awesome. You can pretty accurately asses the sizes of the models by the bases. The Escher are pretty tall. Greyfax sized, maybe. Taller than Cadians definitely. Despide being wide, the Goliaths are not freakishly tall. Galas wrote: An escher is bigger than a old space marine. That doesn't seem right. It doesn't even look correct with those models on 25mm bases. Hmm, weren't the old Space Marines models as tall as a regular human model anyways? Yep. And I'm sure that those hairs are gonna add some mm to the Escher size. Plus, like Greyfax, they have upright poses. Not squatting, not running forward. Necromunda was the first GW game that I played. Buying the 2-gang set is a given for me and I'm glad to hear all gangs will be released. House Delaque shall rise again. I guess the Escher are about 35 mm tall, not counting the hair. Was there ever a Genecult in Necromunda? so I'd be very greatful if someone could do the actual measurements from some kind of photoshop. Maybe in your area....there was a burst of activity to start out that is all but dead around here. No players; leagues collapsed. How much coverage is it getting in White Dwarf the last few months? Almost none other than release announcements? Not exactly scientific, but measuring the Warhammer Community photo of the Escher with the pistol on my iPad screen, her base is about 86mm in diameter in the pic and she's about 114mm to the top of her head. That makes her 114/86*25 around 33mm tall. 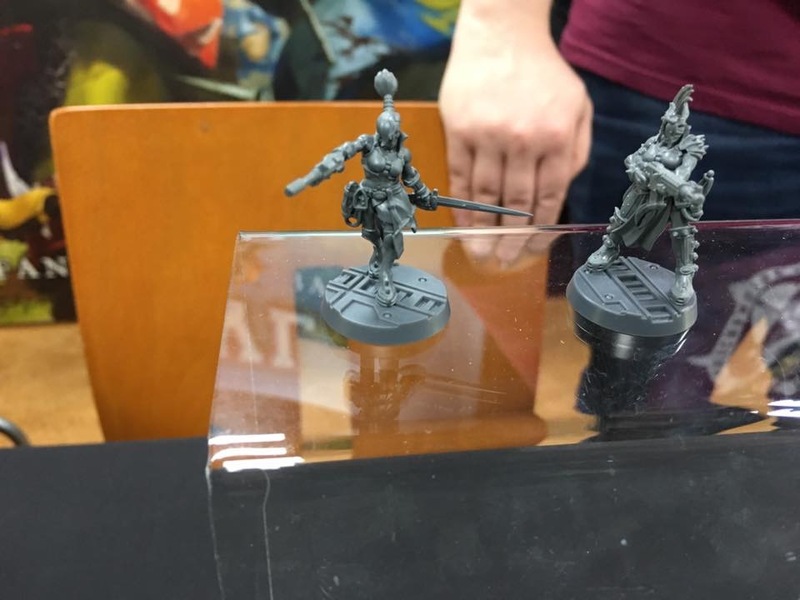 Hoody Hoo, and my word - GW *can* make female minis! Awesome-looking news as well. Everything about his release sounds/looks awesome - especially the action point system. Here's hoping the box set includes loads of walkways and supports for true multi-level terrain out of the box. Apparently Hive Secondus was riddled with them so it got nuked. when they say 'easy to convert' i wonder if the weapons will all have pinned hands so you just pluck off one weapon & add a new one? They'll get weapon close combat and ranged options for ganger and resin upgrades. The kits have been crafted so that even the hair is separate of the heads. Yes, sorry. I have corrected that. They look like they're scaled like Sisters of Silence- I put mine on 25mm bases, and the ones in a wide stance hit the base edges like that escher with a rifle. Shadow War is set on Armageddon, during the war there. Also, fairly certain the previous poster was trolling. Not as an official gang, but there were rules to fight against them in the Outlanders expansion. However, from what they mentioned about Hive Secondus, it is a sure bet there will be rules for GSC at some point. True, though GW quickly added rules for all kinda stuff that didn't strictly fit the Shadow War background and setting, i.e. Tau Pathfinders, AdMech, Genestealer Cult, etc.., because quite a lot of people wanted to adapt it as a more "generic" kind of Skirmish game or Kill Team replacement instead of playing it for what it was. The excuse for no plastic SoB are fewer and fewer with some of these model reveals. Smaller in most cases thanks to their "I just pooped myself" pose and lack of a waist. making the ganers taller allows them to be a bit more realistically proportioned ,whilst having more detail. will there be additional poses in the starter box? so far we see 2 esher and 2 goliath, both with arm swaps. will we be able to create gang leaders heavy's and juives out of the starter box and how many various poses will be in the starter? 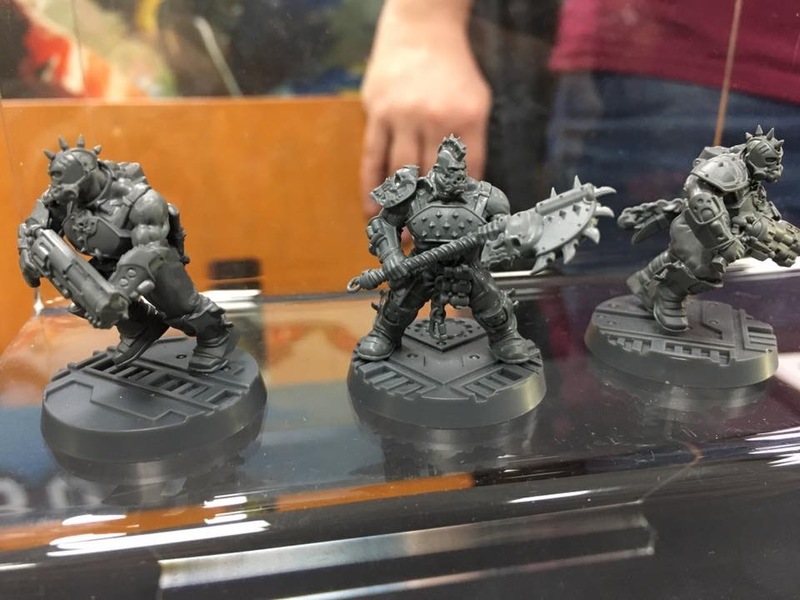 will these starter box gangs get there own gang box release with differant models in it? what will the price point be? will it be released this year or next? Which was my point. It has no setting because every single army can be used. Necromunda is a setting since it restricts available factions and models. We haven't seen any arm swaps yet. The excuse for no plastic SoB was negated when they released plastic SoB. Well, it was nice while it lasted. But that just put this into the same territory as the newer 40K releases - pretty models that I'll look at, but never bother buying because they don't fit with what I already own. If the newer sets are an indication we will get single-pose multi-part models with weapon swaps. 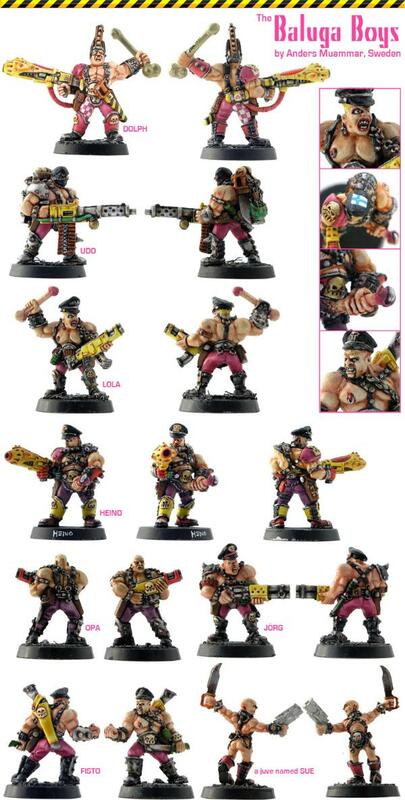 I would expect 2 different poses for gangers, 1 heavy, 1 leader, 1-2 juves for Escher. 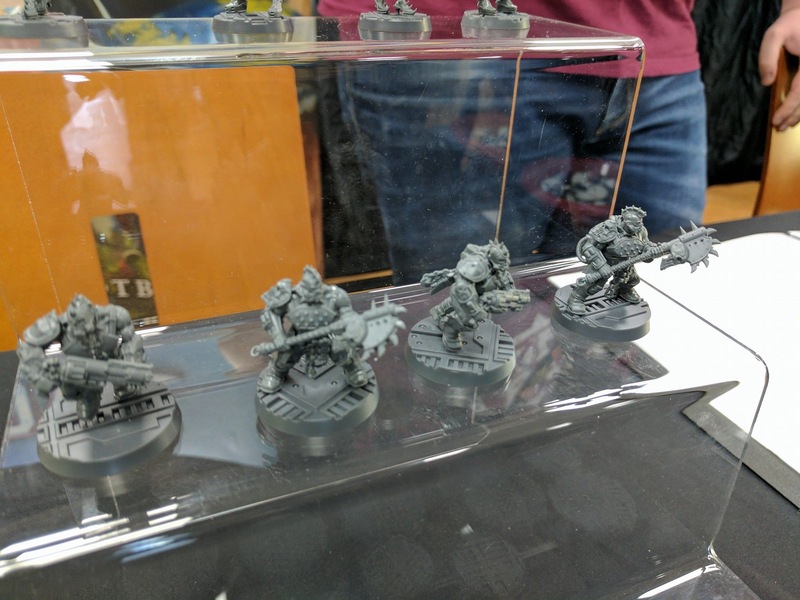 Gw really is getting away from multi-pose models. I still don't understand why so many people are insisting that these models are bigger than the normal humans GW has released in the last few years. 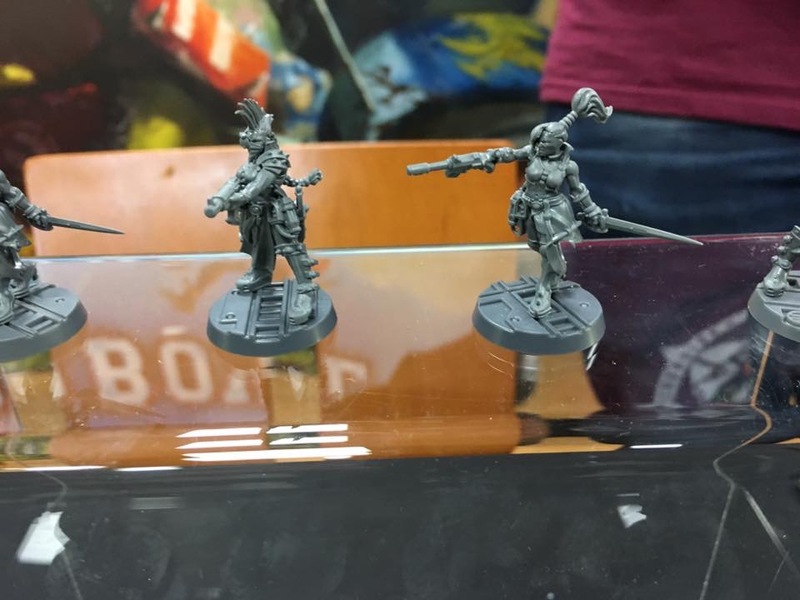 Skitarii, GS Cults, Plague Walkers are all similar sizes. All of primaris marine models are single pose multi-part. Those Escher are going to look great tooled up in Primaris armor. I need a few of those goliaths to punk out my Orks, as well. I might even have to take over a gang of orks and bring them into Necromunda. These do not look scaled at all, its as if a 3/ 3 quarter inch G.I Joe and a green plastic army man had a love child. do those sculpts look like Gak! But that's not the product GW made. Shadow War as initially released had a very specific setting and the armies available (BA Scouts, Orks, Guard) fit that setting. GW only came out with rules for the rest later due to popular demand from people who wanted to ignore the setting. If there's similar demand by people to play Necromunda with Tau Pathfinders vs. Necrons, they might do it again. The restriction on factions is arguably tighter in SWA (only three factions vs. some 6 or 8 even in the most basic Necromunda). Ignore-the-background-and-have-a-laugh-with-whatever-minis-you-have-bolt-on-rules dont change the original setting. There're plenty of rules of this kind with the old Necromunda, allowing people to add Space Marines and Bikes and whatnot. Considering that those figures are on 32 mm bases, they are friggin huge. I dearly hope that those were just the working die sculpts, and not the real product. The Eschers are on 25mm bases and are not huge. The Goliaths are on 32mm bases and are meant to be big lads. What are you talking about when you say other factions were "later"?. They were all released at exactly the same time, just in a different book. Yes necromunda had rules to add single models such as a space marine but not a faction. 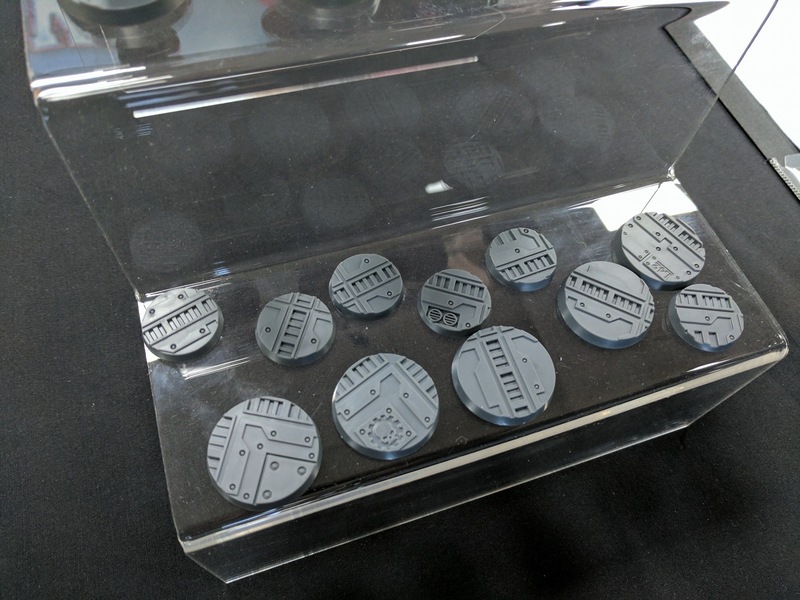 With necromunda tossing aside shadow wars rules it's pretty apparent that it was just another one of their spring "throw away games", not a serious attempt at anything other than marketing new mechancium terrain and depleting the inventory of the cringe worthy sm scouts. I honestly can't tell. I am still trying to get over the crap paint job on them. They have one less joint of flexibility than previous space marines. That doesn't make them single pose. I believe he also did the cover art for the very first edition of WH fantasy. So he's basically been around and shaping the look of GW stuff since before 40k was even dreamed up. The thing about Necromunda is its supposed to have a wacky 80s inspired weirdness, with a dose of cyberpunk/cybergoth styling. I like the looks of these new models so far, and hopefully the rest of the gangs are just as good. The sad thing is i've already got my plate full with dark imperium, still painting the blood bowl set etc. GW keeps knocking it out of the park and there simply isn't enough time or money to do everything. Especially because painting everything is what takes so much time. So now i'm contemplating selling off the 40k stuff I just bought in an attempt to switch to Necromunda...and then when Titanicus comes out i'll be banging my head against the wall. Um .. no? The separate Shadow War Armageddon book outside the box was not originally planned and fast-tracked by GW due to the crazy demand. At that stage they added the rules for factions other than BA Scouts, Orks or Guard. It took two or three weeks of people afraid they wouldn't get rules at all after the box sold out in a few minutes, and several more weeks for GW to get the unplanned re-print (with added factions) to the store (including a rare two-week pre-order window for people to get in). The game was released as a game for BA scouts and/or Guard vs. Orks. Had it been less successful, that is all it would've ever been. Great news for those of you after a copy of the rules for Shadow War: Armageddon. Following the unprecedented demand for this game, our book team have thrown themselves into creating a new rulebook you’ll be able to order separately. Not content just to make the book a copy of the one that appears in the boxed game, though, they have also added in all the extra content too: all the factions that have had their rules published as PDFs will be included. 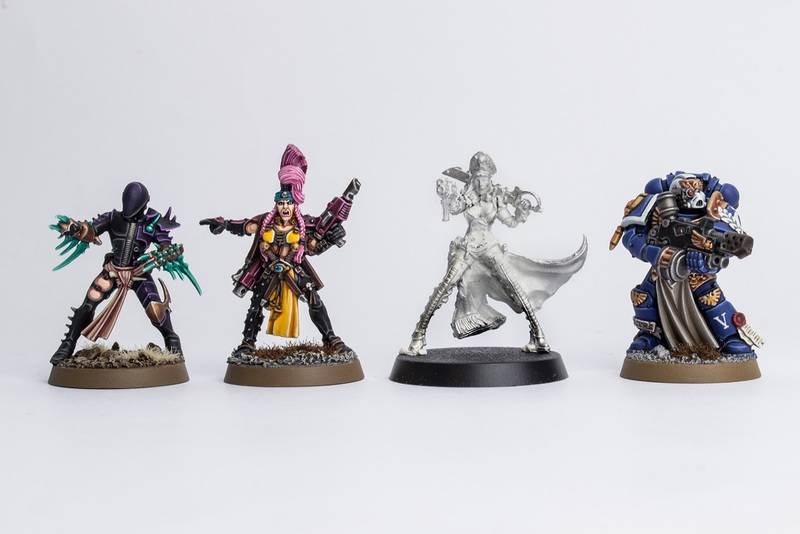 And, following numerous requests we’ve received from the community (that’s you), we’ll be adding in two new factions – the Battle Sisters of the Adepta Sororitas and warbands from the Inquisition. The book will be available to pre-order on Saturday the 22nd of April. The rules for the other factions were released as a download at the same time as the game was released. Being bigger than recent 40k releases isn't the problem. It's being bigger than the existing Necromunda range that is likely to cause consternation amongst veteran players. I would have loved new models to supplement my current Escher, Orlock, Goliath and Ratskin gangs. I'm not interested in replacing those models. How about we take the Shadow Wars discussion to its own thread? Yeah, people shouldn't make a fuss about this at least before we have comparing pics. I'm pretty sure they are gonna be in the same size range as all of those models. Any word on the rules set? Old Necromunda Escher are actually taller than current Space Marines. I don't think the news ones are gonna be in different scales to be noticiable. I can be wrong, and to be honest I'm not gonna bet about this because sure GW loves to make models bigger, since the old Fantasy Empire plastic of 5th to 7th and even before. Personally I don't really mind. Newer figures have been made slightly bigger since... since ever. As technology improved. IIRC neither the Escher or Goliath houses are exactly baseline humans. So I wouldn't want to call scale creep until the other gangs are shown anyway. Now I have basically every old model there is outside of the very rare stuff - but I don't feel GW should be obligated to keep in scale with 21 year old models at all. They are 21 years old! Make them at the modern 40k scale. New Escher look great? I'm in. Nobody is saying GW are obligated to release new models in the same scale as the old range. They can use whatever scale they want. A customer saying that the scale determines whether or not they will buy a product is not a statement that the company has an obligation to use a particular scale. Wow, if those are a taste of what the new models are going to look like that's pretty awesome. I'd really like to see them take the rasta ash waste nomads look someone had in the old Gang War magazine and use that, although I guess the Ratskin's are going to be pretty sweet. And nor is it indicative of a majority of customers. I prefer the taller scale as it allows less "heroic" proportions. All this talk of scale, I had to check and make sure I wasn't at Allspark, Seibertron, TFW, or some other Transformers board. I suppose I should start grumbling about having to build a Necromunda table now. My best friend mentioned vaguely wanting to play Mordheim and I built a whole damn table...grrrr...might end up doing that again. Old Necromunda Escher are actually taller than current Space Marines. Only if you count the hair. They do look incredible i'm definitely going to get a few boxes to not only use in necromunda but to also use as chaos cultists in 40k, it will be nice to mix in some female cultists to diversify the mob. Need to see more factions! I think the new models look great. I can't wait to see cawdor, redemption and scavy. I never really played with any of the outlanders gangs since they were already oop and the rules impossible to easily find by the time I got into necromunda. I would also like to note that these ganger models will be huge for people looking for chaos cultists and inquisition goons. Will make a lot of good bases for conversations let alone with the right paint jobs will probably pass with little to no conversations. Escher is in the starter box. I too hope they are scaled well. The Goliath lads are perfect as Brutes for Marauder squads, since they look worthy of 3 wounds. 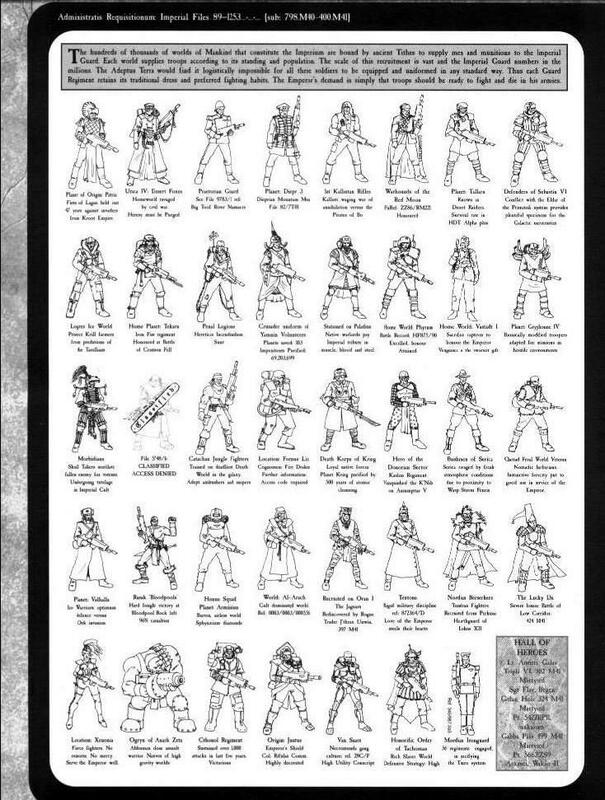 I would be quite guttered though if the majority of the gangers ended up being way taller than normal guardsmen, cultists etc. Oooohhh what if that rumour engine image from a while ago with the banner thingy that people thought it was either a SoB banner or part from a Minostorum Priest. What if it's a part from the Redemptionists or Cawdor? The one on platform shoes stands pretty tall.. I mean.. is anyone surprised by that? The one that is in regular boots looks normal to me.. The Goliath all look pretty normal. As per usual, we won't really know until we have them in hand. I will say that I do hope that isn't going to be the common size for all the Goliath pistols. I'm kinda hoping that is some form of grenade launcher or rotating shotgun. I am really hoping they are scaled appropriately to the new Primaris (scale). Primaris weren't re-scaled, they were re-proportioned. The heads and hands remained the same scale and the body had it's proportions adjusted to match the lore. Humans are human scale as they should be (28-32ishmm to the eye depending on intended height). I know most people aren't going to understand the distinction but humans are meant to be the baseline. If they make humans bigger, then everything else will have to be bigger. That's how setting a scale works. That said.. if you meant to say you hope the humans are reproportioned as to not have giant balloon hands and feet and truncated abdomens.. then yes.. I agree. The average human (heroic scaled) should be 8 heads high and the width of 2 hands should be about the width of their face. The chest should be about 2 heads wide. Elbows should rest at the ribcage and fingertips in a lowered and relaxed arm should rest mid-thigh. Knees should be about the middle of the leg. These are all basic landmarks that I had to learn as an illustrator. They are guidelines and not rules but the further you get from these, the more the look will start to skew. By comparison.. you establish scale by saying.. on a average human, eye level at this scale (regardless of all this talk about overblown 25mm or 28mm isn't a real scale.. ).. once you declare that this is a base unit of measurement, then you have said that in the scale for this game, 28mm = ~5' (or average eye level according to google). If something in this scale is meant to stand 8' tall, then you'll want to add just under half of that again to properly represent 8'. This will be roughly 40mm for a roughly 8' figure. Guess how tall Primaris are.. Sorry for being off-topic but I keep seeing people talking about scale and proportions and it's been irking me. Both the Escers and the Goliaths are about a head taller than the previous metal miniatures - and about the same height as more recent releases. Also, as you can see, the height of GW miniatures vary alot (just as people IRL). For the record, that big fellow you put in the middle is a conversion if you weren't aware. A godly conversion at that. Ken doing the Emperor's work! I wish Exalts would show or something. While I still have all my old metal Escher gangers somewhere, I think I'll use the Second Coming of Necromunda as a good excuse to hunker down and really work on my Raging Heroes Jailbirds models. 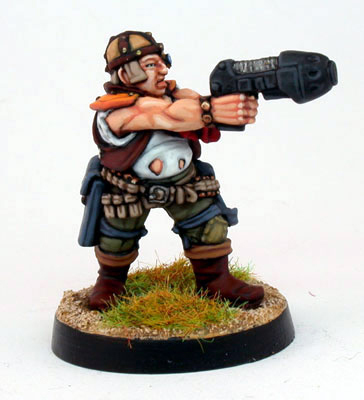 By the way, anyone want to start a betting pool to see how long it takes for Raging Heroes to have a Necromunda-inspired sale for their Jailbirds models? They are all my minis, the big fella is just the free AoS mini I got with White Dwarf, he is no taller than the original one (not counting the Duardin/Dwarf mohawk). My oh my great work putting that together thx! MLaw wrote: For the record, that big fellow you put in the middle is a conversion if you weren't aware. Isnt Greyfax on a 32mm base? I cut her loose and reattached her on a 25 mm base just for this group shot. I put all miniatures (except for the unreleased Necromundians) next to each other when I took the photos - so their relative sizes are exactly correct. Note however that I have washers (to add weight and to be able to use magnetic trays) under a few of the bases - and that some minis have rather high scenic bases. So yes, as feared, they're gigantic. I might be excited enough about new models to wait and see how they actually look mixed in with the old models... if it's not too glaring on the tabletop, then it can just pass off as normal human variation, although it makes conversions between them trickier. But it's certainly dulled my enthusiasm considerably. At least I still have all my Van Saar conversions! Looking forward to seeing the new rules. Ahhh wonderful I can get into this for sure! I believe he also did the cover art for the very first edition of WH fantasy. So he's basically been around and shaping the look of GW stuff since before 40k was even dreamed up. The thing about Necromunda is its supposed to have a wacky 80s inspired weirdness, with a dose of cyberpunk/cybergoth styling. The whole aesthetic of Necromunda came out of 2000AD which began in the 70s. Necromunda is, to all intents and purposes, Megacity 1. Citadel produced Judge Dredd miniatures from 1985, with the miniatures evolving into the Arbites. Maegacity 1 had different gangs such as the 'Fatties' and 'Angels', which shaped the aesthetic of the first gangs from Confrontation. 2000AD was hugely popular at the time that Rogue Trader was introduced as well so if anything shaped the look of 40K it was artists such as Ian Gibson and Alan Moore who were imitated by people such as Blanche. Everything is derivative but there was some incredible talent coming out of Britain in the 70s and 80s which was hugely influential. And has her hair in like a two foot pony tail. I'm going to be very interested to see the Van Saar gang, that's my choice to play with! They're not "gigantic", they're in line with modern releases. I'm sorry if you expected a plastic mini cast in 2017 to be the same size as a pewter mini cast in 1995, but that's on you, not GW. Playing with the las pistol/sword Escher in photoshop, I'm coming up with 33.86mm to the top of her head hair (not counting the topknot), so Crimson is pretty close. Man, GW sure does listen these days, it's great! Really hoping for sets with TONS of options, lots of different guns/head/accesories. You should be able to get a few gang boxes, and be able to assemble all the figures in every set as noticeably different looking models. These gangs will be great assets to 40k armies as well. Obviously, they make great chaos cultists, but also, if they have separate heads (and maybe even not if they're delaque) they can easily be made into genestealers brood brothers. Then there's acolytes for the imperial agents. Imperial Guard recruits from other worlds. Lots of cool stuff! I hope there's a good mix of male & female gangers as well, it makes more sense that everyone would fight in these instances. And yeah, the Escher should have a few men as well (though if I recall my fluff correctly, they're rather pathetic dudes). On that note, glad to hear that classic figures will be remade, I love some of those old figures. I hope chaos cultists and Genestealer cults will be in the underhive as well. It would make a fun element to the game, and give the redemptionists more stuff to get 'fired' up about. We've already covered that. There was no expectation. I don't have a problem with GW releasing minis in whatever scale they want. My sole point is that I'm not interesting in changing scales. I have a bunch of Necromunda miniatures already, so new miniatures are only appealing if they fit with what I already have. So yes, that's 'on me'... I've never made any claim that GW were doing anything 'wrong' with the gradual scale creep, just that I'm not a fan of it and that will affect my choice to open my wallet or not. Yeah, cultists (of both types) are pretty perfectly suited to the setting. People in real life are different heights. I'm sure the miniatures will look fine together. Well, that's me sold. I know what my next project is after my 30K Blood Angels. Oh man, this is great. The minis look great (in the raw plastic at least), and I'm loving the slightly larger scale and better proportions. I can't wait to see the arbites. Would be far too OP for Necromunda probably, but would be fun to see them make a plastic Repressor to go with them. Scale creep is unfortunate. I'd rather they be scaled to fit the chaos cultists released in the Dark Vengeance. Wouldn't be too hard for them to modify the Goliath rockgrinder to make a newer version of the repressor. Actually, yes. Like almost every bit of work we've seen in this style(I assume it's one guy but maybe this is the new "house style" for FW/SGS, either way) it is technically proficient but does a piss-poor job of showing off the detail of the model - look at the Escher ganger with the laspistol relative to the bare plastic version, all the detail on the face has been "blown out" by the highlights and she looks like a painted china doll. And that's been a near universal problem with this painter/style - people see the painted model and react badly, then they see the bare plastic or resin and realise there's actually loads of detail there on the model that the painter has obscured; it's like a photo taken with too much flash. When the point of this stuff is to "sell" people on the miniatures enough they'll fork over FW/GW prices for them, I'd say if you get to the stage that people would rather judge by the bare plastic that "dodgy" is a fair description. On the multipart vs multipose discussion: tbh don't care. If they provide a set of solid body poses with a good selection of heads and a wide array of weapon & gear options, that'll do me. Unlike the Primaris their clothing/armour isn't uniform so not being multipose will make things a bit more limiting, but I can put up with the additional effort of doing reposing myself and there's something more to consider this time around that we didn't have back in the 90's - the sheer range of conversion fodder. If you need more Goliath poses you've got Bloodreavers aplenty to tech-up with spare bitz; indications are other gangs will be getting female miniatures that you can plunder and punkify to expand your Escher if the range provided doesn't provide enough variety for your taste; GSC and Skitarii bitz will make creating more unique "techy" styled gangs much easier. Not to mention, the great likelihood is the third-party market for not-Necro models is going to bloody explode once there's a new version being sold and supported in stores, so as long as you're not stuck playing only in a GW store(condolences) there will be even more options out there to choose from and this time around they'll just be a google search away. When you measure Greyfax in a way that accounts for her armoured stiletto heels she's about 30mm to the eyes, 32mm to the top of the head(sans hat), which is consistent with the Scion-and-afterwards plastic humans for 40K(which often appear shorter due to their pose and relative bulk) most of which are either the same size or taller than the old Marine kits(basically everything except Deathwatch and Primaris). Like Greyfax, the Escher appear to have some pretty gnarly footwear going on there, so hopefully they're consistent with GW's "post-CAD" scale. Honestly while I can understand it's disappointing, there was never any realistic expectation that they would deliberately produce models that don't fit in with their modern product range, consternation at them being in-scale with recent human plastic kits rather than the old metals would be like consternation at GW if they finally released a new plastic Imperial Guard box and didn't scale them with 1990's metal Cadians. Also, its not like those models will have no potential use - I'm assuming there will still be Juves in Newcromunda, models with a similar aesthetic in a slightly smaller scale would be ideal for them no? They are. DV Cultists, Scions, Skitarii, GSC - all the recent GW human kits, once you account for pose and gear eccentricities, are 29-31mm to the eye. These look like they'll fall right on that scale as well. EDIT: The Escher, I mean, the Goliath look to me scaled more in line with the Bloodreaver kit(GW's new "big human-but-not-transhuman" size). When people suggested the teaser was for Necromunda I hoped, but didn't want to get my hopes too high. Now it's finally here! The more I hear and see of Newcromunda the more I like it. The new rules sound like they will hopefully be solid, and the new miniatures look like they will be awesome. I was really excited to hear that we will be getting all the old gangs back, and that there will be new ones is icing on the cake. With the new plastic kits I look forwards to going to town with conversions, and they will be really useful for other post-apocalyptic games and the new 40K RPG as well. It seems like this is a good time to be a Necromunda fan! Cancelled my Game of Thrones pledge as soon as I saw this. New minis look great. Cannot wait to see more. Look, I get that scale creep is a thing. But it doesn't have to be a thing, and it's a little infuriating that GW keep doing it. It might allow for prettier models... but the end result is pretty models that don't fit in with existing collections, and that's just frustrating. I am sure all Heroes and Specials will be FW. It's not really scale creep in the case of human models, it's a scale jump they did several years ago (when they moved to CAD basically) that they've kept consistent ever since. looking at the corrected comparison pic, the Escher look to be about 2mm taller than the old ones, with head, hands and feet being the same size. I don't see the problem, and I'll certainly use them with my substantial metal Escher collection. We had the rules for all the others at the store when the demo kit arrived 2 weeks before it came out. But this isn't scale creep, is the point. They established a new scale, and they've stuck with it consistently for four distinct plastic human releases over several years and now intend to continue sticking with it with the Newcromunda plastics, which is good - you bring up the Cadians, well look at the recent discussion surrounding vague rumours/hopes of plastic Steel Legion; which is more common, people hoping they're in-scale with the recent widely praised human plastics, or people hoping they're in the same scale as the 17 year old metals? Which hope is more realistic? What you were hoping for wasn't an end to scale creep, it was a reversion to a previous scale they haven't used in decades, and while it may be frustrating for you they're not doing that it was never a realistic or reasonable expectation. This is pretty exciting, as I've got Escher and Spyrers ready to play. I wonder what the rules will be like. people hoping they're in the same scale as the 17 year old metals? Establishing "a new scale" is the very definition of "scale creep". Given how stupid it is that ordinary humans have gotten HUGE in the move to plastic, and how it devalues plastic SMs and Orcs and Nids and everything else, going back 20 years for the size of a regular human recruit is the best idea. I've said as much before, and I'll say it again. Plus, the plastic Catachans and Cadians look stupid. I do wonder how Spyrers will turn out in this new rendition. Well all of that money I haven't been spending on 8th edition and all those new stupid marines, looks like GW have found a way to get hold of it. I'll probably being buying one of everything they release for this game.